Youth and Skin Care Concept - Beauty Woman face Portrait. Beautiful model Girl with Perfect Fresh Clean Skin. Isolated on white background. Beauty woman portrait. Beautiful model girl with perfect fresh clean skin, natural professional makeup and oranges on background. Blonde female showing ideal manicure. Youth and skin care concept. Beauty woman portrait. Beautiful spa model girl with perfect Fresh Clean Skin and natural professional makeup. 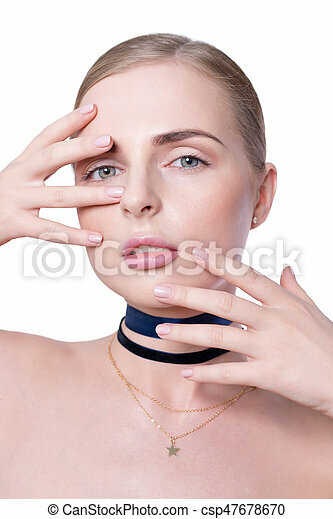 Blonde female crossing hands showing ideal manicure. Youth and Skin Care Concept. Over white background.